We saw these in Radio Shack today and my girlfriend just had to have one! I must agree - they are adorable. The hard part was choosing which one to take home. They come in five different colors and styles - orange (Alpha), green (Bravo), blue (Charlie), yellow (Delta) and pink (Echo). It was almost like adopting a pet from a shelter! We finally decided on Charlie. 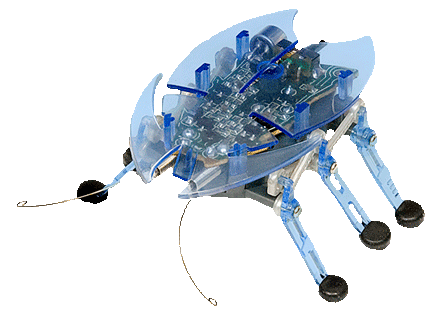 These little robotic bugs will happily go along their merry way until one of their antennas come into contact with an obstacle or they hear a loud noise, such as a clap. They will then back up in a left hand half circle and then continue on in their new direction.